Wengen holiday resort lies on a wind-protected sun terrace at the foot of the Jungfrau, 400m above the Lauterbrunnen valley at an altitude of 1,274 m. The traditional car-free holiday resort offers a family-friendly ski and rambling area around the Männlichen and the Kleine Scheidegg. Lauterbrunnen is situated in one of the most impressive valleys in the Alps, between gigantic rock faces and mountain peaks. With its 72 thundering waterfalls, secluded valleys, colourful alpine meadows and lonely mountain inns, the Lauterbrunnen Valley is one of the biggest nature conservation areas in Switzerland. The very name Lauter Brunnen meaning many fountains tells you all you need to know about the lower village. The 72 waterfalls in the valley, the most famous being the Staubbach Falls plunge almost 300m from the overhanging rock face, and are one of the highest free-falling waterfalls in Europe. It is based just below Wengen and offers a cheaper location yet still with great access to the extensive ski area. The Jungfrau region can be reached easily from Wengen. Climbers on the Eiger north face can be seen by telescope from Kleine Scheidegg. The Jungfraujoch can even be reached by railway, and you can reach the Schilthorn summit from the valley floor resort of Lauterbrunnen via Mürren or Stechelberg. With traditional timber houses, Wengen is small, but some of it is built on a sloping hillside with old-world hotels and Stadels scattered here and there. It has retained all the character of a picture-postcard mountain village, opening widely to the south west, the terrace guarantees above-average hours of sunshine. Since 1893, car free Wengen has been able to be reached from Lauterbrunnen by cog train. The houses, small cobble streets, car free village, clean and quiet atmosphere means it holds a great deal of charm. Many of the best restaurants in Wengen are in hotels and a number of these have been awarded 15 points by Gault Millau. There is something for everyone, as with most resorts in the Alps these days. There are restaurants from every corner of the world offering nearly every type of food. Wengen differs slightly, but not in quality or choice, as most restaurants have dinner service until around 9:30pm. Compared to most resorts this appears quite early, but Wengen is mainly a family based area so should not deter most people. With so much going on in the evenings in the 2 villages there are plenty of places to grab a nice drink after a day on the slopes. Après ski is excellent here, from quiet informal cafes to lively bars with music and rock bands. There are bars for every taste, night clubs are generally free entry and they and the main bars offer a number of theme nights as well. Wengen itself is the ideal starting point for the family-friendly ski area, with over 110kms of predominantly easy to medium pistes being in the Kleine Scheidegg area and offsetting this is the renowned World Cup piste on the Lauberhorn. Once you reach Kleine Scheidegg from Wengen, there's a lot more skiing in the neighbouring region of the Jungfrau, this includes Grindelwald and Mürren-Schilthorn. This expansive ski area can be quickly reached by mountain railway. 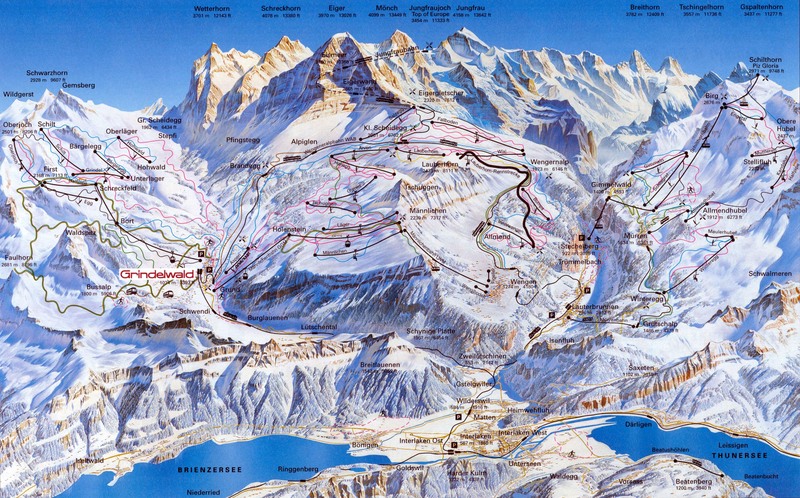 There are over 45 lifts altogether in the Jungfrau region as well as over 215km of pistes and fun parks. There is plenty of terrain for beginners. This includes nursery slopes in the centre of the village and as much as 30% of slopes in the combined area are suitable for novice skiers. Wengen is where all levels of intermediate skiers come into their own with almost nowhere they cannot get to. Over 80% of the runs in the area suitable for intermediates. The remainder of the runs are suitable for advanced skiers. Sometime you may have to look a little carefully to find the top end difficult runs but the World Cup piste should keep you busy all day! We use one of the top Sports Shops in Wengen, Central Sports and we can offer you a massive 25% discount!